A demolition exercise ongoing at St Luke Guest House in Gulu Municipality. Courtesy photo. Gulu: Authorities in Gulu Municipality have for the second week running continued to defy interim injunctions stopping them from demolishing what they term as condemned structures in the municipality. The municipality launched the demolition exercise on July 5 from Bar Dege Division, despite an order from the National Physical Planning Board (NPPB) and Gulu High Court to stay the exercise. The municipality earlier this year gave a two-week ultimatum to property owners to destroy the ‘condemned’ structures on their own failure of which the council destroys them. The town dwellers protested the move and on February 14, 2017 wrote to the NPPB through their association, Gulu Property Owners Association, complaining that the ultimatum of 14 days given to them was not enough and there was no scientific studies done to ascertain whether those houses are dilapidated or not. Residents of Kony-Paco in Awere Road subward during the demolition recently. As it is contained in section 46 (4) (5) of the Physical Planning Act 2010, the appeal serves as a temporarily injunction until mediation is done. After the municipal turned down the injunction, on February 21, the property owners through Barenzi & Co-advocates, a Kampala law firm dragged the municipal to court under Public Interest Litigation pursuant to Article 50 (1) and (2) of the 1995 constitution. They requested for, among others, an order of permanent injunction to restrain the municipal authority from implementing the enforcement notice. On the March 2, 2017, assistant Registrar Gulu High Court Henry Twinomuhwezi issued an interim order restraining the council from destroying the condemned buildings till June 19, 2017. Within this period, the municipal authorities failed to make a statement of defence in the application. The municipality town clerk, Francis Barabanawe, reportedly authorised the exercise, arguing that the municipal authorities had nothing to lose if they defied the orders. 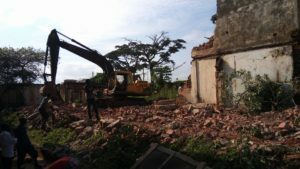 The exercise which started on the July 5, has seen many houses with ‘Red Cross Marks’ demolished over the past days in the divisions of Bar dege, Laroo and Pece. The chairman of the Property Owners Association, Leonard Odoki, said the decision to condemn the houses was done in a rudimentary manner because engineers were never involved and they should have been given more time. In 2011, the municipal council came out with a list of 113 houses to be demolished and most of these buildings are along the Main Street. The decision was protested and an injunction was put in place. To date those houses have not been demolished. The municipal council has never revoked that decision since then and this year again, they earmarked more than 200 houses for demolition affecting more than 1,000 residents. The interim order was again extended up to August 18, 2017 where the judgment for the application for the order of permanent injunction will be heard. The municipal speaker, Okwera Peter Onen, said they would continue with demolition because the interim order is binding for only four applicants. Residents of kony Paco in Awere Road subward during the demolition recently. Courtesy photo. The main argument by the municipal authority is that these property owners have been given enough time and the houses they live in are so hazardous for their lives. However, the counsel of the plaintiff Tony Kitara filed a contempt of court order application against the municipal officials which include, among others town clerk Oluba Alfred, LC3 chairman of Layibi Kelly Kumakech, Pece LC3 Chairman Denis Nono and Municipal Secretary for Education and Health Moses Abonga. The judgment for the application will be on the July 26, 2017. Gulu Municipality is among the four municipalities on the quest to attain city status.